6 AXIS GYRO with posture control - Integrated design guarantee the precise positioning of the aircraft. Charging time is about 120 minutes while flight duration is about 7-9 minutes. Modular design makes it easy to install and repair. Remote distance is up to 30m. 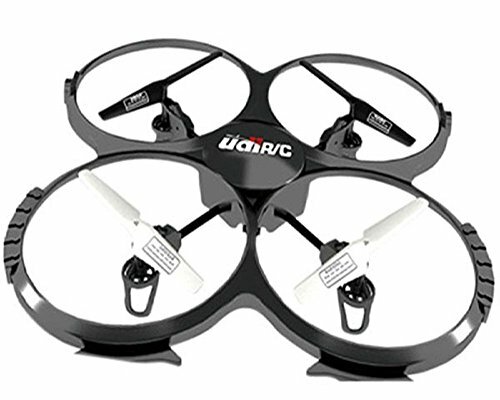 3D Full Flight: Various control options for those piloting the U818A Up/Down, Left/Right, Forward/Backward, Leftward flying/Rightward flying, Suspension, 360°flips, Video recording, Photographing Includes: 1 x U818A RC Quadcopter with Camera, 1 x 2.4G Remote Controller (does not include 1.5v AA batteries), 1 x AC Adaptor, 1 x Charge Box, 1 x 2G MicroSD card, 1 x LiPO 3.7V 500mAh Battery, Main Parameter: Helicopter Size: 410 x 410 x 60 mm, Helicopter Weight: 4.6 oz, Packaging Size: 546 x 368 x 95mm, Packaging Weight: 2lb 9.1oz, Battery: 3.7V 500mAh LiPO, Charging Time: about 120 mins, Flying Time: 6~9 mins, Controlling Distance: about 30 meters, Step 1. Insert the battery into the quad-copter and plug it in the receptacle. (Make sure battery is fully charged.) Step 2. On the Remote Control make sure the left throttle stick is all down, then insert new batteries and turn on the remote. Step 3. Wait for few seconds to see if both device will sync. You will hear three beep sound when devices are paired. (Proceed to Step 4 if device is not synced.) Step 4. On the left throttle stick, push it all the way up and down quickly. Step 2. On the Remote Control make sure the left throttle stick is all down, then insert new batteries and turn on the remote.